"I have two children almost 7 and 8. They have been in a private Montessori school since the age of 3. I have just taken them out and they actually start public school on Monday. I’m terrified. This was not by choice that I made this decision, but rather by necessity. Private school is really expensive. "My thought is to work with them in the evenings and at some point maybe just pull them out of public school and home school them. My main concern is whether I can do this or not. make. I literally cry when I think about it. I loved what they were learning in class, but I have no concept of how they learned it. "I want to implement Montessori at home and have my children continue to receive a Montessori education, but I also want to make sure that I’m capable of doing so. My fear is that I will do more harm than good. Any help you could give me would be greatly appreciated." My heart goes out to moms in this situation! I know this is a difficult decision! My advice as a Montessori teacher and a mom: give the public school a chance, wait and see how it works out for your children. Chances are your children will be advanced compared to the other children in their class. This is not a bad thing, but one issue to watch for is boredom. Stay in close communication with their teachers and the administrator regarding keeping your children challenged. Some public schools have programs for "gifted" and "advanced" children, ask your school what they offer such students. My friend has a very bright child who can get easily bored if not challenged. He just entered a public school from a Montessori preschool, but the public school is one of the better ones, and starting in the third grade, they have a program for advanced, gifted children. The mom is already on the ball. And she volunteers one morning a week at the school. As for your feelings and fears, I don't want to say hide them, but help your children feel supported. Start off by trying to have a positive attitude about their new school, new teachers, and new friends. What I do not recommend is trying Montessori at home while they are in public school. Public schools now-a-days demand a lot from their students in the way of homework, etc. Children in school have a lot more pressure than when we were in school. So stay positive and support them as much as you can. Keep in close contact with the school. 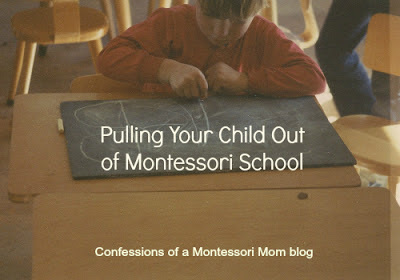 And if things do not work out, you now have Plan B: Montessori homeschool.